If you’ve been wondering why I’ve been kind of quiet here lately, here’s why. I’ve been trying to keep something BIG a secret, and in the process I kind of just ended up keeping my mouth shut. Now, though, I’m ready to share! I’m pregnant! I’m thrilled. We’ve been married 10 years now, and since it hadn’t happened in all these years, we had started thinking about what life would be like, going forward, without children. I haven’t been too sick, but I’ve been pretty tired. (You may have noticed a spate of tweets to that extent in the past month or so …) I haven’t been so tired that I haven’t been reading or knitting, though. The hat above is one I finished last week. 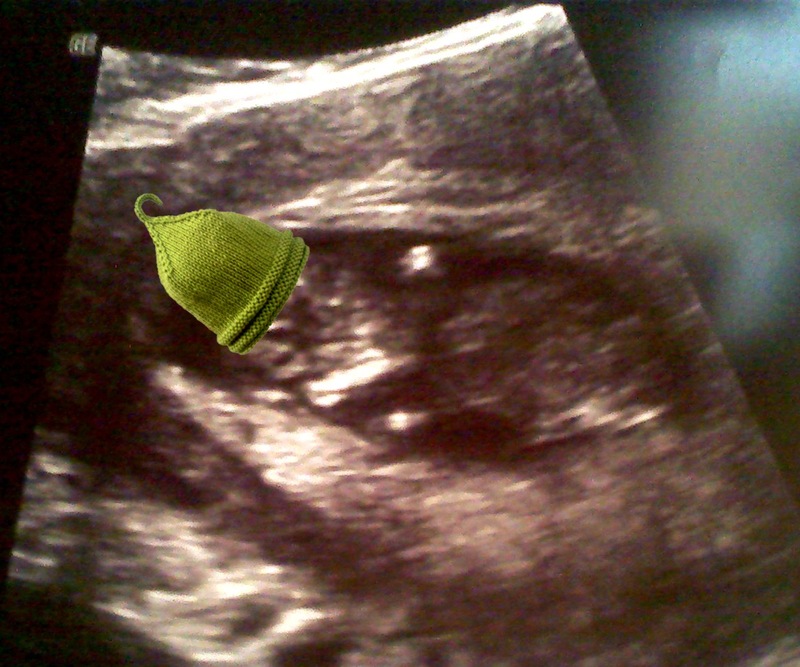 We’ll welcome Sprout into the world in April. This entry was posted in WordLily and tagged Sprout. Bookmark the permalink. Yep, that’s big news for sure! Sincerest CONGRATULATIONS!!!! Enjoy!!!! Congrats Hannah and Paul! I’m so happy for you both! AHHHH!!! That is so awesome! I am so excited for you!!! (And love the hat!) Congratulations to you both! AHHHHH!!!!! So happy for you. What wonderful news!!! Congratulations to you and your husband! The hat is adorable! I’m so excited for you! Congrats!! Oh congratulations! That’s wonderful news! Congrats and welcome to the wonderful world of motherhood! I know I’ve already told you by email, but congrats again! we are wonderfully excited for you!!!! and for us!!!! Congratulations Hannah! And what an adorable picture! This is wonderful news! I pray all will go well. I am so happy for you! Congratulations!!!!! Fantastic news– I am so very happy for you both!!! WOW! What an amazing gift. Have a wonderful pregnancy Hannah! Oh, congratulations, I’m SO excited for you!!! I’m so so so excited for you Hannah! I wish I could describe the pure joy that motherhood is–through all the hardships it’s just simply amazing. Huge huge congratulations! That is sooo exciting! Woo hoo! Congratulations! That is so exciting! Best wishes to you all. Congratulations on your pregnancy! I was told it would be difficult to have children on my own due to PCOS, left it to God, and now have two under two! It’s an amazing ride, the hardest thing I’ve ever done, but oh so worth it! Best wishes! Jason and I were in the same spot, having been married 11 years and with one miscarriage we weren’t sure it was going to happen for us and we had started looking at our future, childless. We were okay with that, but it is such a joy to welcome a baby into the world. The only problem with having been together sooo long is that you enjoy a routine and after Sprout arrives in April you can count on never seeing that schedule again! But it is totally worth it. Best new ever I am sure! Congratulations on such fantastic news 😀 Very exciting! This is wonderful news – congratulations!! !